Ligamentum flavum hypertrophy is also known as ligamentum flavum thickening, or occasionally, as ligamentum flavum stenosis. This condition involves the ligamentum flava, or aptly named yellow ligament, which is one of the soft tissues inside the spine. The yellow ligament attaches inside the vertebrae, posterior to the central canal and anterior to the lamina. This ligament links the individual vertebra together and also helps provide an elastic supportive bond which facilitates controlled movement of each vertebral level. Sadly, like so many other spinal structures, this soft tissue is subject to degeneration and injury, possibly causing it to swell and become hypertrophic. This dialog focuses on the mechanism through which spinal stenosis might be created due to ligamentous hypertrophy. Ligamentum flavum stenosis is a condition in which the ligament itself grows larger and wider, expanding in towards the central spinal canal. The yellow ligament can impinge on the posterior side and lateral sides of the spinal canal, occasionally enacting a significant partial stenosis effect on the rear of the central canal. In less common instances, the ligament can also impinge on the lateral recess, potentially causing lateral spinal stenosis. Partial stenosis is rarely an issue at all, but in situations when the ligamentum flavum thickening exists at the same time and same level as another spinal abnormality at the frontal side of the canal, the potential for serious or extreme spinal stenosis exists. 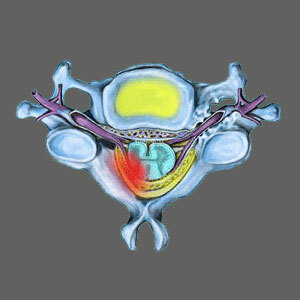 The most common causes of spinal stenosis exist in the anterior side of the central canal. These include herniated discs and degenerative disc disease. Arthritic changes can also cause bone spurs in the lateral or anterior sections of the vertebral foramen. When any of these conditions, or any irregular spinal curvature, narrows the front of the spinal canal at the same time as the ligament thickening narrows the back, the possibility for symptomatic spinal stenosis increases drastically. This is because now the entire central canal is compromised by impingement or compression, limiting the circulation of cerebral spinal fluid and possibly placing force against the spinal nerve roots or the spinal cord itself. Remember the old saying about being caught between a rock and a hard place? Well, this is it, and the thing that is caught in between is your spinal cord. The yellow ligament deteriorates and loses elasticity and structural integrity as part of its normal lifespan. Some degree of hypertrophy is normal and a finding of ligamentum flava thickening, particularly in the lumbar spine, is to be expected in many patients. In most people, this condition is not problematic or symptomatic to any noticeable degree. However, when the stage is set just right, the thickening of this particular ligament can seal off the central canal and help increase compression of the sensitive neurological structures in the spine. In these circumstances, treatment might be indicated or may even become a medical necessity.